1. Can you tell me a little about the OVMA? The OVMA is a volunteer-driven, not-for-profit organization with about 1,000 members (or about 75% of the practicing veterinarians in Oregon). We are the only statewide veterinary association dedicated to the promotion of your profession and the protection of your professional interests as a veterinarian. The OVMA’s roots date back to 1911, when 26 charter members formed the State Veterinary Medical Society. In the 1940s, this growing number of veterinarians merged with the Willamette Valley Veterinary Medical Association to form the Oregon State Veterinary Medical Association. Articles of incorporation were again filed in 1960, when the organization assumed its present name, the Oregon Veterinary Medical Association. 2. How do I join the OVMA? Fill out our secure online application form. Alternately, you can print the form and mail or fax it to the OVMA office in Salem. Upon receiving your application we will add you to the roster in good faith so that you can log in to this website, get the newsletter and other important mailings. The OVMA Board must officially approve all applications, and you will be notified when you have been approved for membership. 3. What are the annual membership dues? New veterinary graduates receive a one-year complimentary membership in the OVMA, to coincide with our fiscal year (July 1 - June 30). First time members (not recent graduates) start at this step. Members who live outside Oregon. Other membership categories exist for retired members and life members. Contact the OVMA office for eligibility requirements. For federal income tax purposes, 94% of your dues payment may be deducted as a normal business expense (6% is attributable to lobbying and is not deductible). OVMA dues may not be deducted as a charitable contribution. Learn more about the benefits of membership in OVMA, as well as the services we offer to our members. We think you'll find membership is a good value. 4. Can you tell me more about the Board of Directors? The OVMA Board of Directors is comprised of an Executive Committee and eight district representatives. The districts geographically represent veterinarians across the state. The Board meets three to four times a year; it helps to shape, direct and carry out goals, policies and guidelines of the Association. The Executive Board includes the President, President Elect, Vice President, Immediate Past President and Treasurer. The Executive Board has the authority to conduct business of the organization that cannot wait between regular meetings of the full Board of Directors. The President, with assistance from the Executive Director, determines meetings of the EB. Ex-officio members of the Board also include a representative from allied industry, practice managers, and technicians. The OVMA Executive Director serves in a non-voting capacity. 5. How does the OVMA and AVMA interface? The OVMA has a Delegate and an Alternate Delegate who serve in the AVMA House of Delegates. Both the Delegate and Alternate Delegate are appointed by the OVMA Board of Directors. 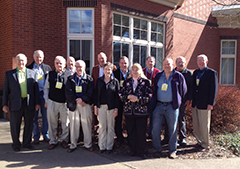 The Board of Directors also routinely interacts with the AVMA District XI Representative. 6. Is the OVMA the state agency responsible for my veterinary license?